COFCO, a major Chinese company active in agricultural markets, released a statement in late January at the World Economic Form (WEF) in support of shoring up “sustainable” practices and curbing deforestation in commodity supply chains. COFCO’s CEO, Jun Lyu, warned industry that failure to curb climate change could lead to poor crop production and limit companies’ ability to keep up with rising demand from population growth. This scenario would facilitate reputation and business risks. “The repercussions on businesses in terms of profit, reputation and investment will be catastrophic,” said Lyu. The company also endorsed forests as a solution to climate change, arguing for the need to develop agricultural supply chains that do not increase deforestation. COFCO owns COFCO International, the company’s trading arm, which already has a deforestation policy in its Code of Conduct. The recent statement from COFCO reflects how no-deforestation is now a company-wide target. COFCO’s goals reinforce China’s ambitions in combating the effects of climate change: In China, consumers, companies and the government are in favor of stricter standards in agricultural supply chains. Climate change and other environmental damages are growing risks to Chinese citizens as population rises and global competition for agricultural commodities is forecast to continue to increase. Given COFCO’s role in the global economy and soft commodity markets, the company’s call to raise ambition could signal a major shift in industry support for curbing deforestation. 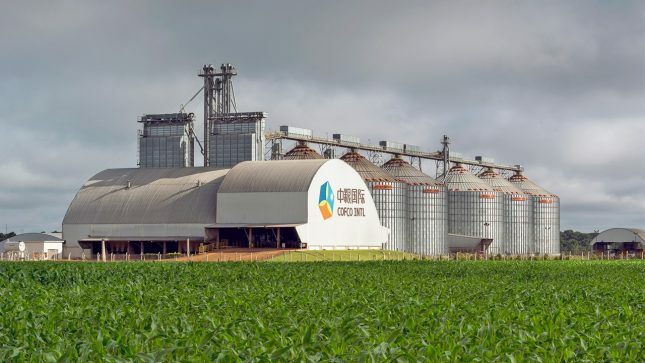 COFCO’s presence in exporting soy from Brazil has expanded amid rising demand and the U.S.-China trade conflict. The company is rivaling established traders such as ADM, Bunge, Cargill and Louis Dreyfus. Its actions and commitments to zero deforestation could play an increasing role in reducing deforestation in Brazil. COFCO highlighted progress in reducing deforestation in Brazil as a result of measures such as the Soy Moratorium and the Cerrado Working Group. Lyu referred to the Tropical Forest Alliance (TFA) a “promising” initiative. TFA is a public-private partnership working to achieve zero net deforestation in key agricultural supply chains. COFCO International tweeted TFA’s paper released in coordination with the WEF. TFA’s report highlights the need to eliminate deforestation from commodity supply chains, urging industries, governments and civil society to take aggressive action with a list of priorities, including redirecting financial flows to “sustainable” agricultural production. Investing in commodity supply chains that do not increase deforestation is a sound business decision, the report says. Such action “can create new and profitable investment opportunities, while mitigating stranded asset risks.” Financial threats from stranded assets are a growing worry in the industry. In previous reports, CRR has covered this risk in Indonesia’s palm oil market and in soy production in Brazil. Through several listed entities in Hong Kong and China, international shareholders and other financiers are exposed to deforestation risks by COFCO entities. COFCO has four companies listed in Hong Kong: China Foods, China Agri-Industry Holdings, Mengniu Dairy, and COFCO Packaging Holdings. COFCO also has three companies listed in mainland China: COFCO Tunhe, COFCO Property and BBCA. Although a statement at the WEF meeting in Davos and Codes of Conduct of COFCO subsidiaries are no guarantee to reducing deforestation, developments in China on deforestation appear to be gaining momentum. This trend might open up channels for international investors to engage on deforestation issues with the various COFCO entities. 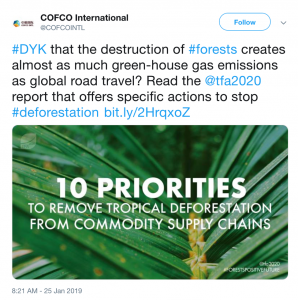 If COFCO implements the TFA criteria, it may put pressure on its suppliers to also adopt no-deforestation policies or face the risk of losing the Chinese company as a customer.